She’s a woman in early middle age – she would have been called handsome by her contemporaries I think with what you might call strong features and a determined expression. Mr McCulloch liked to get behind the camera as well and he took other pictures of his wife and his art collection. Here she is in another, in front of another group of paintings. Did Mr McCulloch intend to step in and occupy the empty chair himself? She stands clutching her gloves. It seems to me that she might be in a hurry to get somewhere else. 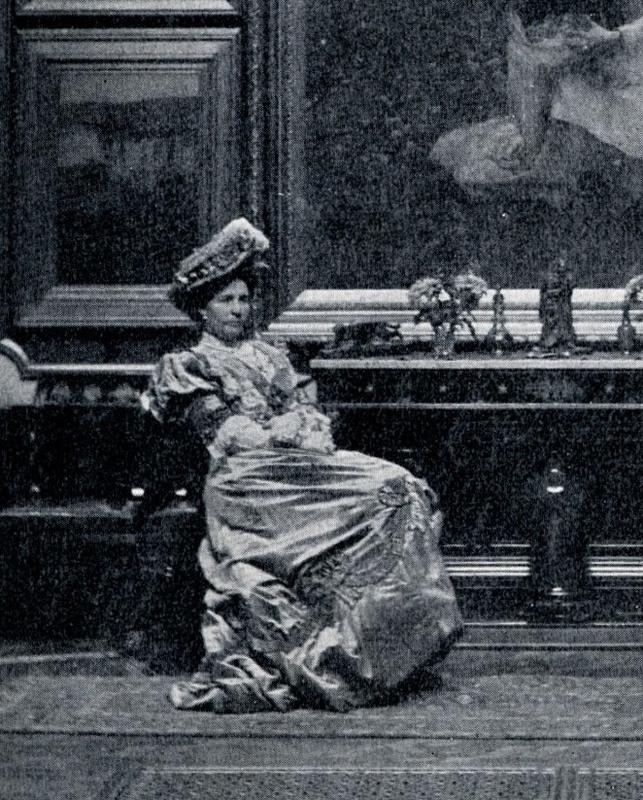 There is something about Mrs McCulloch which told me that while she was comfortable enough in her expensive dresses and her grand home she had also experienced a different kind of life. By the way I’m not entirely dead to the significance of the pictures on the wall. 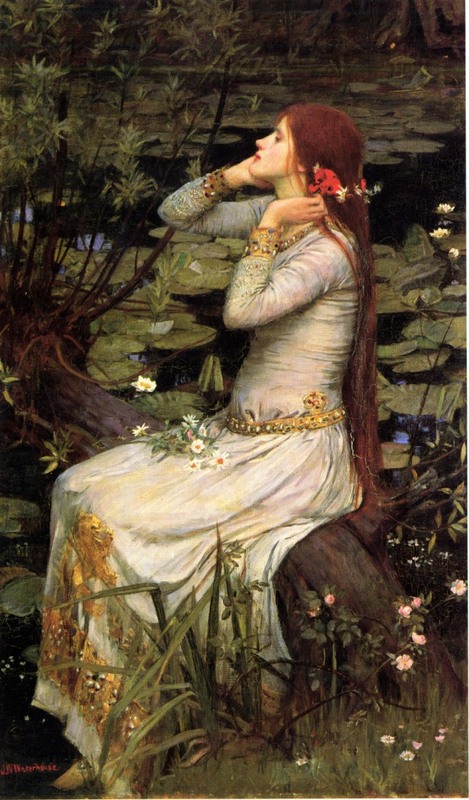 Just over her left shoulder is Ophelia by J W Waterhouse. 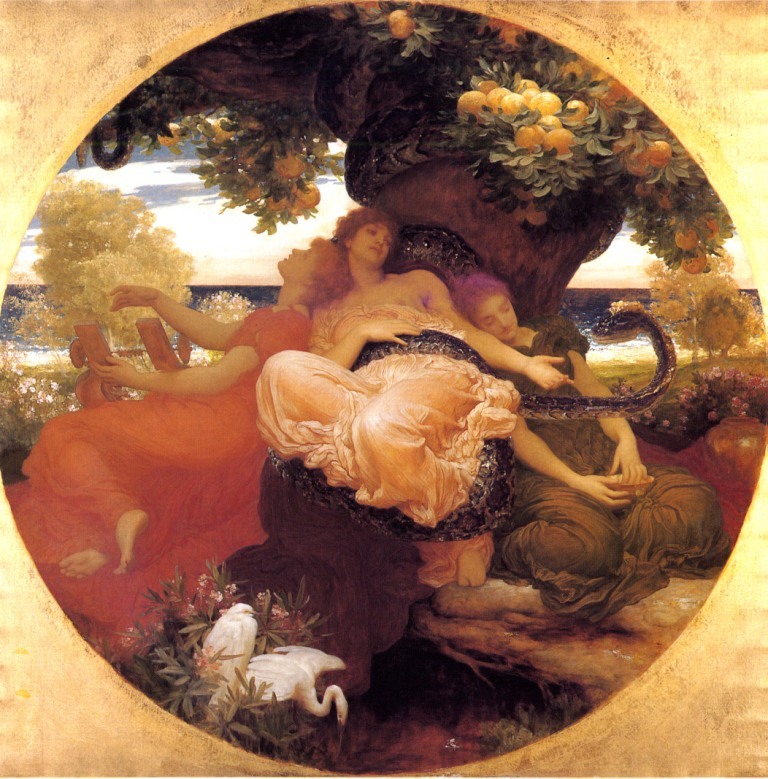 Go back to the picture of Mr and Mrs McCulloch – the central picture is the Garden of the Hesperides by our very own Lord Leighton. For the record, George McCulloch, who had made a fortune from mining in Australia was a serious art collector who owned a number of famous paintings. If you can spot any more well known works in these pictures let me know. 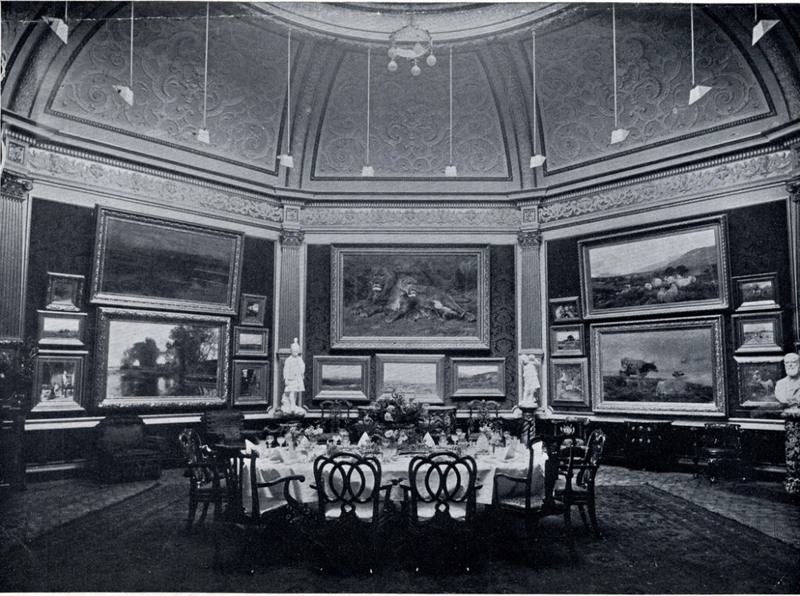 I’d like to know the identity of the pictures hanging in this domed dining room particularly the one in the centre with the two lions. Mr McCulloch died in 1907 leaving over £400,000 to his widow. These were the days when that was a lot of money. But Mary Agnes McCulloch had not always had that kind of wealth. She was born Mary Smith, the daughter of a miner in Broken Hill, Australia and had married a man named Frans Mayger. Mr and Mrs Mayger worked for George McCulloch as handyman and housekeeper in his house at Mount Gipps near Broken Hill. Frans died when he fell from a horse and Mary moved to Melbourne. But she met George again there and he brought her with him to London. They were married at the Strand Register Office in 1893. George’s pictures were sold for about £130,000 (a disappointing figure apparently as he had spent about £200,000 amassing the collection). Mary married again to the Scottish artist James Coutts Michie, who had been an artistic adviser to Mr McCulloch. It is his name which starts to appear in Kelly’s Street Directory for 184 Queen’s Gate after 1907. 184 is the third imposing house from the right. But we’re not finished with Mrs Mary Coutts Michie yet. 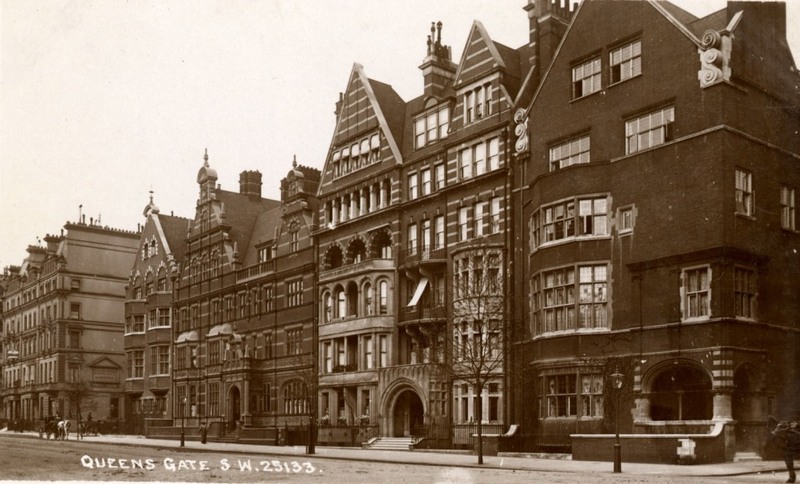 During the First World War she turned her house into a hospital with 168 beds for servicemen. Several houses in the area were also converted and she ran the Michie Hospital, as it became known, herself. Is this her in the picture below with the staff of the hospital? It may be wishful thinking on my part but the woman in the matron’s uniform has the same determined look as Mrs McCulloch the art collector’s wife. She was awarded the OBE for her work during the war. Her third husband died in 1919. Her son Alexander rowed for England in the 1908 Olympics and survived the Great War. In 1925 she was back in Broken Hill, donating a picture to the local art gallery. This photograph, which I have held in my hand, is something which quite probably Mary McCulloch held in hers. She is perfectly comfortable in the sumptuous evening outfit she is wearing but she has the air of someone who could ride a horse, do housework or run a hospital if she wished and would be perfectly happy to do so. She’s not in Who Was Who or the Dictionary of National Biography and I haven’t yet been able to find out the date of her death but for the moment my curiosity about Mary Agnes Smith Mayger McCulloch Coutts Michie is satisfied. Coincidence: Many of George McCulloch’s artworks were bought by Lord Leverhulme, whose garden was the venue for some of Margaret Morris’s dancers a couple of weeks ago. Quirky fact I couldn’t work into the main text: according to Kelly’s along the road from Mrs McCulloch’s house at 169 Queen’s Gate was an apartment house where a man named Edward Ittison Pronk lived. It’s a bit silly of me to find this amusing but I had to pass it on. My thanks to Isabel who speculated with me about the identity and background of the lady in the pictures and heard the facts come out in installments. 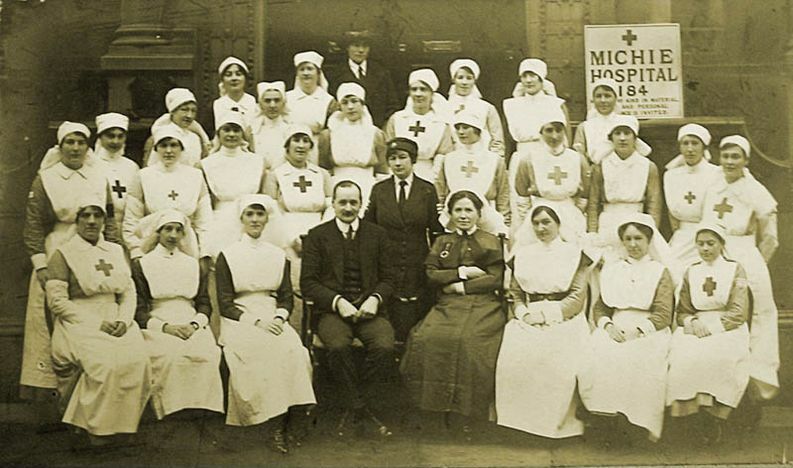 The picture of the Michie Hospital staff comes from Wikipedia. This entry was posted on Thursday, February 14th, 2013 at 12:23 am	and tagged with Australia, George McCulloch, kensington, Mary McCulloch, Michie Hospital, Photographs, Queen's Gate and posted in 19th Century, 20th Century, Biography, Kensington. You can follow any responses to this entry through the RSS 2.0 feed. Hi Dave. Fabulous post as usual. 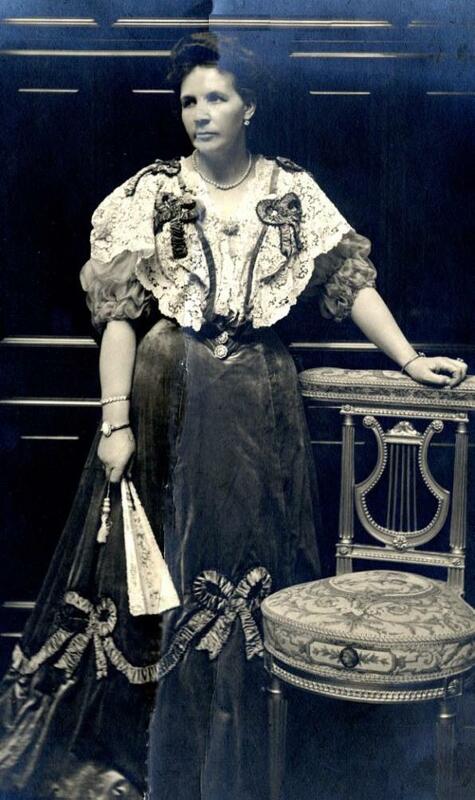 Mrs McCulloch reminds me of Australia’s Dame Nellie Melba in so many ways both in looks and temperament. I’m pretty sure the painting in the centre of the third photo is ‘October’ by Jules Bastien-Lepage held by rhe National Gallery of Victoria in Melbourne. I’m reading this on my mobile and not sure how to hyperlink but if you search on their website you’ll find it. Will take a look at other pictures when I’m on a bigger screen! Thanks for the identification. I thought that one would turn out to be something interesting. Been looking on the Ancestry site and found this entry for Mary Agnes Michie. She died 29 Nov 1945 leaving an estate of 58,740.18s.4d. She was still living at her address in 1933 as she shows up in the electoral roll, but at the time of her death was at “Broken Hill” Miles Lane, Cobham, Surrey. Attached is a copy of her probate record. Thanks for this information. Someone else told me as well and added that she gave her birthplace as Nottingham in the 1911 census. A very well travelled woman. There are also two more Sargents (one in the Lady Lever and one in private hands) showing McCulloch’s son Alexander on the fishing trip to Norway that George, Alexander and Sargent took together, though neither of them seems to match up with your images as far as i can tell. The resolution on the original photos is such though that I couldn’t rule them out or the possibility that there is another painting from the same trip there. Tamara. I love this post and am amazed at how quickly the other comments have provided links to documents and the art that was on the walls in these exquisite photographs. It’s a fascinating historic jigsaw puzzle. Hi Dave, your time machines always leave me with a great sense of nostalgia over what we have lost. I would call Mary’s facial expression ‘hard’ or tough. How’s this for a plot – Mary & George fall in love and they murder her husband with a blow to the head, he “fell off a horse”. She runs off to Melbourne to divert attention, otherwise suspicion would be rife if she had become his open lover. He joins her there and she gives birth to an illegitimate son – Alexander McCulloch in 1887.They then elope to England to get away from the scene of their crime, where they get married, far enough from Oz so that no one back there knows about it. She enjoyed the first crime so much that she bumps off George in 1907 and gets all his money. She sets her sights on another rich sucker – Michie and does him in in 1919, and gets his money too. Not bad for a one time cleaner. She likes being around dead men so much that she sets up a hospital for them. I wonder how many men died there? It would be interesting to see ’cause of death’ on the certificates for George and Michie. Why did she go back to Broken Hill – to gloat? I’m about to start the novel!!! The large painting of the lion and lioness is by Rosa Bonheur, it’s listed in the exhibition catalogue (not the sale catalogue) which another comment has linked to, painting number 158. Thanks, I may add a colour image to the post. The original of the Lions at home is now in an art gallery in Hull apparently. The painting adjacent to Ophelia is ‘Master Baby’ by Sir W Q Orchardson, now in the Scottish National Gallery, which acquired it in 1913, a rare example of a natural portrait of a mother and baby. The image is in the public domain. There’s more about George McCulloch in the online Australian Dictionary of Biography. John MacRitchie (blogging at Manly Library Local Studies blog, Sydney). I just came across your very interesting article on Mary Michie who was my great-great-grandfather’s sister. Except for the information relating to the death of her first husband I found your article to be very accurate. Although, the death by falling from a horse was apparently the story Mary kept to in interviews in later life. After Mary returned to England as McCulloch’s housekeeper in 1891 her first husband (who was in poor health) went to live with her sister’s family in Sydney where he ran a grocer shop. He died in 1892. 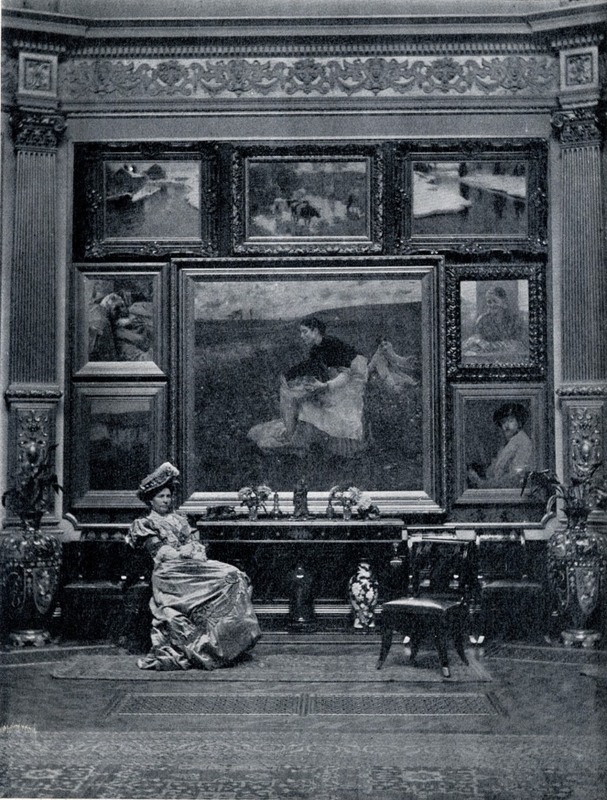 In 1909 McCulloch’s entire art collection was exhibited at The Royal Academy Winter Exhibition at Burlington House. McCulloch died in 1907 and left his estate in full to Mary.The photographs which you have (probably taken by McCulloch who was a keen photographer) are from a special number of “The Art Journal” (of which I have a copy) published at the time of the exhibition as an illustrated catalogue, containing 140 pictures of many of the works on display. Among the works illustrated, the catalogue contains photographs of two portrait paintings of Mary one by Dagnan-Bouveret and one by James Coutts-Michie who was later to become her 3rd husband. George McCulloch established the Broken Hill Art Gallery in New South Wales and both George and Mary made donations of works to it. They also donated many other works to other Australian Galleries. 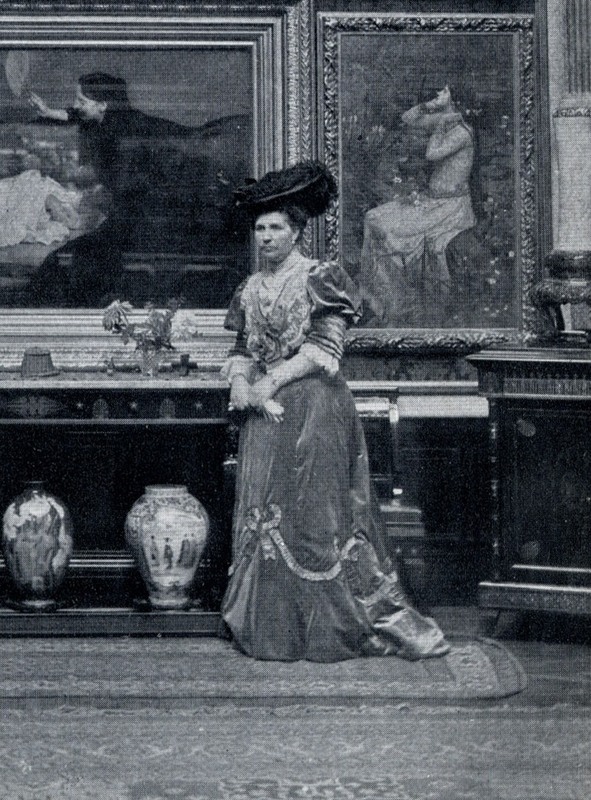 Mary had quite an incredible life and spent a significant amount of her wealth on her charity work, in particular the Michie hospital during WW1 and on support of the arts. She was the longest surviving of 12 children to a Nottinghamshire miner who emigrated to Australia in the 1870’s. In 1925 after a return visit to Australia she moved into a home at Cobham Surrey which she named “Broken Hill”. This is very interesting as I am presently researching my MA thesis on the Collection and home of George McCulloch, which was bombed in WWII. 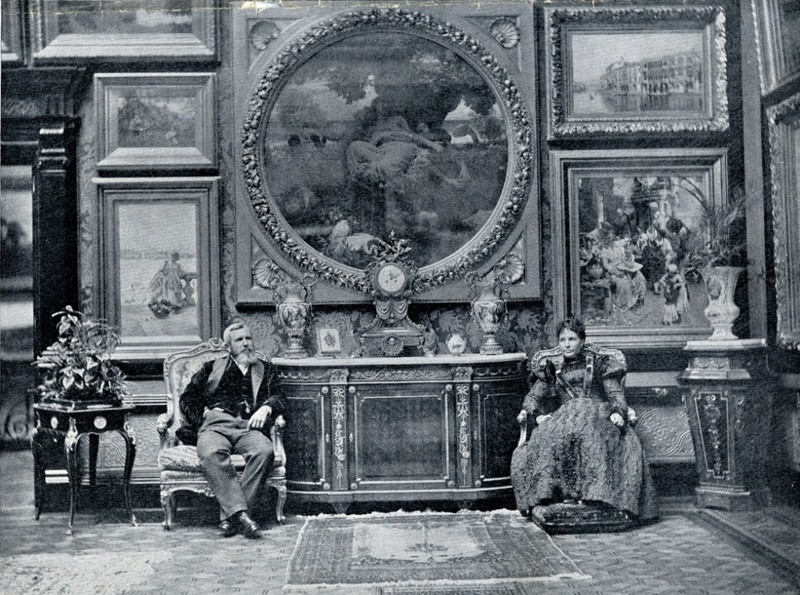 The painting in the middle of the dining room, is The Lion at Home 1881, by Rosa Bonheur, a French Realist painter. One of the paintings to the right of it, looks like The Setting Sun by Adrian Stokes. The painting on the bottom right, next to Bastein-Lepage’s Potato Gatherers is a self-portrait by Whistler. The painting, bottom left of Leighton’s Garden of Hesperides is Henry Woods, La Frinella, at bottom right, a Venetian Fete by C.C.van Haanen. Thanks for this extra information. I may do a follow-up post on the artworks at some point. It might also feature some of the research by David Wright whose work on his family history is extensive and meticulous. My husband Charles McCulloch and I read your article with interest and also the more recent one about Mrs McCulloch’s Pictures. 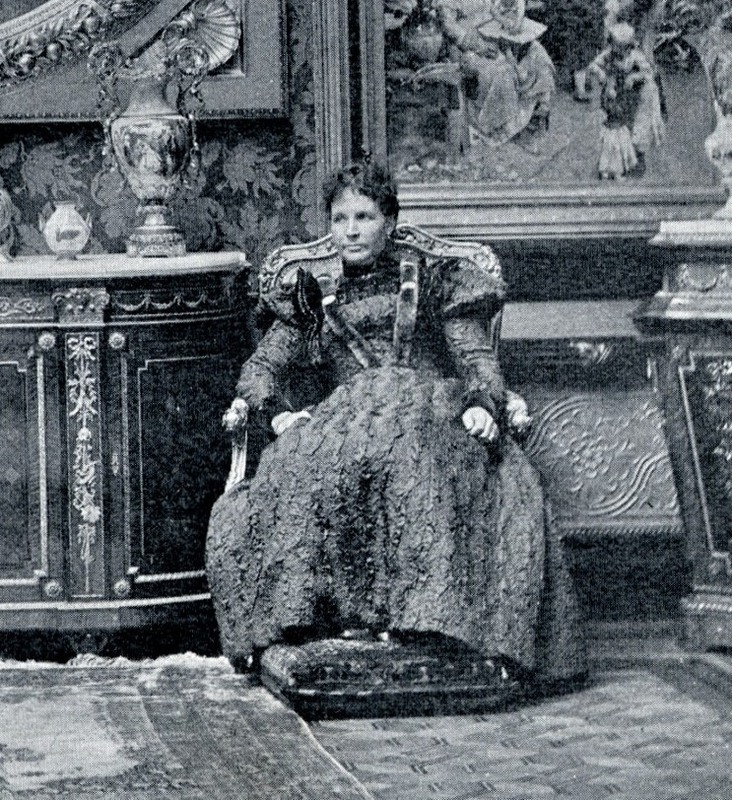 All that remains in the family is a portrait in charcoal of Mrs McCulloch and George by Pascal Dagnan-Bouveret, and a pencil sketch of their son Alexander (Charles’ grandfather) by John Singer Sargent, neither of which would have been of sufficient importance to hang on the walls of 184 Queensgate, but certainly justify prominent positions on the walls of our far more modest home! For my research into the Collection of McCulloch I am also looking into his commissions from Morris and Co. One of the commissions was a series of stained glass windows from the designs of Burne-Jones. Only a fragment of one remains which is in the Collection of the William Morris Gallery. Do you or any member of your family have any information about where they were situated in the house? They were not commissioned till some years after the completion of the house at Queen’s Gate. Thank you for that information on what remains in the family. There are also drawings by Sargent, gifted to the South Australian Art Gallery,by Mary Mitchie and an oil portrait of Mr George McCulloch, 1901-02, at the Boston Athenaeum, by Peggy McCulloch Jacobson, 1996,whom I assume is closely related. Also a Sargent painting of George’s son at the Lady Lever Gallery which you have probably seen. I have been following this article with interest as James Coutts Michie is my husband’s 1st cousin (2 x removed). We have been up to Aberdeen to see his paintings that are held in the gallery archve. Whilst there we were shown a marble bust of Mary Michie that has not been on display.We have also been to see a painting held in the archive at our local gallery the Walker in Liverpool.I am glad there some art works still left in the family. The portrait of Alexander McCulloch by Singer Sargent (Norway on his holidays) is also easily seen by us as the Lady Lever Gallery is not too far away. From Lady McCulloch 1889 – probably the same person – can send you photo of her signature if of interest. Thanks. Yes, I’d like that.